We were woefully early for dinner. The hotel’s restaurant opened early to cater to tourists and when we sat down to dine at 8:45 p.m., not a single table was taken. See, dinner in most of Spain doesn’t really start until 9:30, maybe 10 at night. For a pair from Albuquerque, where the evening “rush” happens as early as 5:30, eating at our typical bedtime took some getting used to. Back home, the last time we saw midnight might have been New Year ’s Eve. Uh, New Year’s Eve, 2008. Now we were lucky to get the check before the next day arrived. As an MSer, staying up late typically holds about as much appeal as sunbathing midafternoon in the parking lot of a Walmart on a sweltering, humid summer day in Houston. But after living with this disease for nearly a decade, I’ve learned that if I don’t adapt and adjust, I’ll face unkind consequences. In this case, starvation and a hungry, grumpy wife. Travel always tosses curveballs into your daily routine, just like MS does. Fatigue can trample you like a wayward bull terrorizing the streets of Pamplona (I survived). Some hills are just too steep to safely navigate. Sandy beaches slowed my already slow walk to a crawl. Cobblestones meant I had to pick a very careful path. And at times, stairs were simply unavoidable if I wanted to see some sites, like the otherworldly rooftops of famed architect Antoni Gaudi. Of course there were the misadventures that somehow follow me around whenever I step foot outside my front door. Like the time I locked myself into a handicapped bathroom so securely it took nearly 15 minutes, a credit card, and a bit of prayer to jigger the stuck lock open. Visions of Spanish firefighters sawing through the door as a flotilla of television news cameras captured the extraction on national TV were thankfully not realized. And then there was the time we somehow, unbelievably, ended up at the finish line of a road race exactly where runners were sprinting for the ribbon. There apparently was a good reason such an appealing gap existed in the sea of euphoric pink-shirted sweaty people. “Hombre with Esclerosis Multiple Causa 27-Persona Accidente“ the headline was certain to scream before Laura pushed my wheelchair at a clip that I swore broke the sound barrier. Ah, life with multiple sclerosis. Homer (the Greek poet, not the Simpson) once wrote “the journey is the thing.” Indeed it is. In his tale The Odyssey, it took Odysseus ten perilous years to return home to Ithaca after the fall of Troy. Meh, whatev. I’m already in my 10th year of my personal MS odyssey, and I intend to press on as long as the heart beats, forever adapting to my ever-changing world. I have to. All of us with this disease have to. Now of course Homer prophetically also wrote that “even a fool learns something once it hits him.” Like a pack of runners barreling into you while unwisely crossing the finish line of a road race that is at its conclusion. Touché, Mr. Homer, touché. This past weekend for the first time in more than half a decade, I was spending the afternoon on the bike trail. And admittedly it was thrilling to take in all the scenery that was passing me by… uh, quite literally passing me by. I was passed by teams of spandex-clad cyclists with matching road bikes. I was passed by friends out for a leisurely Saturday ride. I was passed by an overweight dad on his son’s too-small squeaky mountain bike. (Admittedly, at this this point I started looking over my shoulder for grandmothers riding fixies festooned with baskets and bells.) “On your left” was the repeated refrain. And I did not care. 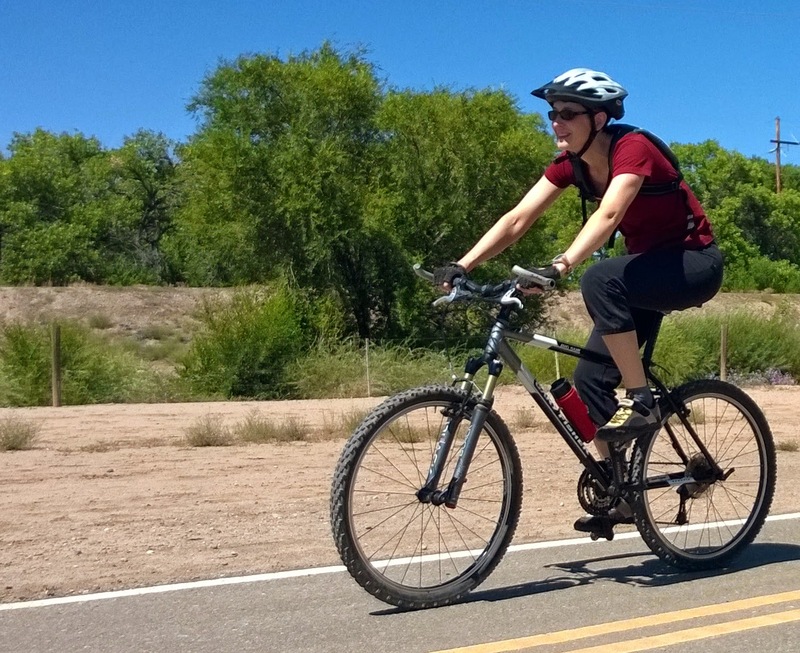 I finally was cycling again… with my wife, outside, on a brilliant day. Sure I was traveling at a speed more accustomed to joggers. I pedaled up tiny hills at such a lazy pace that the sun’s position in the sky visibly changed before summiting. Heck, to keep pace with me when she wasn’t sprinting ahead to get a little exercise, Laura nearly had to pull trick-riding moves to balance on her two-wheeler. In the past, this might have frustrated me immensely. After all I used to be a regular cyclist, even organizing special event rides on this very trail (e.g., Bike for a Burrito, slogan “it’s a gas”). Over time, though, I’ve learned that when you have multiple sclerosis, there is little to be gained by bundling valuable energies into mourning the body of your past. Savor the present instead, and turn shortcomings into opportunities. On this afternoon I was going so slowly, I could stare down animals along the trail that in the past would have skittered for shelter as I romped by. I could overhear curious kids squeal to their parents to look, loook, LOOOOK at that cool bike and how badly they wanted one. I could daydream to the hypnotic fishing-reel tck-tck-tck of the rear hubs when I coasted on the flats. And I could marvel as future Olympians steamrolled down the trail directly toward me. Egad, daydream over! Seriously. Long-distance runners from the women’s 2016 Japanese team were training that day, taking advantage of Albuquerque’s mile-high altitude and perfect 70-degree weather. Coaches, each laden with a half dozen stopwatches, monitored their every step. Members of the squad kindly nodded my direction as our paths crossed. Perhaps one day I’ll have to learn how to say “左手に” to pass these marathoners while speeding along on my trike, but for now I’m quite content to be the slow dude on the right. I cry at sad movies. I need two cups of coffee in the morning. I sleep naked. I believe curiosity doesn’t kill the cat, stupidity does. I like kids who are curious. I scratch if I itch. I know that if you hold down that little lever in the fridge the light goes off. I vote my conscience. I get mildly upset—no, pissed—when someone takes my parking space. I inhaled. I believe no one should salt their food before tasting it. I sew. I think super-heroes don’t exist, but heroes are all around us. I eat leftover pizza for breakfast and enjoy it. I wait until April 14th to do my taxes just for a challenge. I count fat grams. I like a hot kiss on a warm night in a cool part of town. I ate glue in 2nd grade. I like verbs. I always reach around the first milk in the dairy section and grab the one behind it. I wear my emotions on my sleeve…sometimes. I dream big dreams in color. Being disabled doesn’t mean being different. I’m a person just like you. With feelings, opinions and convictions. Do your part. 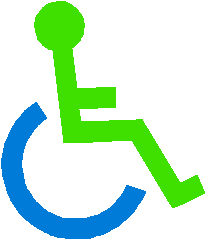 Help eliminate the barriers facing persons with disabilities. Encourage and invite disabled individuals to your parties and playgrounds. Choose places that are accessible. Let kids ask questions—it’s okay. And please, watch where you park your car. I originally wrote this in 1997, 10 years before being diagnosed with multiple sclerosis. A woman, a talented abstract artist, needed help expressing herself—and conveying her experience of using a wheelchair—in print. As an able-bodied 27-year-old writer, I found it empowering and enlightening to approach the challenges of being disabled from such a perspective. For this 2014 edition, only one change was made (for somewhat obvious reasons): I removed the line “I check the pay phone coin return slot even though I know I won’t find a quarter.” Was I destined to be a voice in this community I’ve come to embrace and champion? Signs point to yes. Let’s cut right to the chase. If the nursery rhyme “Ring Around the Rosie” were to ever become an Olympic sport, folks with multiple sclerosis would be destined for glory. Not only do we “all fall down,” we fall down with such regularity that people might mistake us for soccer players. How to tell the difference? When we are writhing in pain, we’re typically not feigning injury (unless the cooler full of beer is just too long of a walk and you are trying to enlist spousal sympathy—a tactic that rarely works and I speak from experience). It might seem obvious that researchers, in a large meta-analysis of nearly 600 MSers in four countries, concluded that folks with this disease are at a “high risk of falls and there are important associations between falls and MS-associated disability, gender and age.” Duh. Numb feet, wonky balance, rubber legs, bad eyesight, and a bumbly brain tend to influence such things. But if you read the full study, a more interesting picture appears. Permit me not to mince words: we largely are a stubborn group, with easily bruised egos, intent on not looking disabled. Looking through the data, researchers zeroed in on one group in particular: the tweeners, those who are starting to need walking assistance but technically can go without. "It suggests that fall risk peaks at an EDSS score of 4.0 (when quantifiable mobility limitations are first acknowledged) and 6.0 (when a walking aid is required)." Do you wall and furniture surf, smudging up the house like a three-year-old? You are a tweener. Do you avoid taking a cane to work to so you won’t be known as the token disabled person? Yup, you are a tweener. Does the thought of using a walker mortify you, yet deep down you know it would probably help? Bingo: tweener. And parsing the data further only reinforces what we already know. Ego plays a large role in our will to appear healthy and able-bodied. It's not the old geezers who are concerned about how they look in public (most already crossed that hurdle when they started wearing black socks with shorts), it’s the youngins. "Sustaining multiple falls was associated with younger age and the relative rate of falls was higher for younger participants." Predictably, gender matters, too. Who traditionally has the most easily bruised ego? Dudes. "In our sample the men had a significantly higher fall rate than the women, suggesting that men with MS who fall are at risk for frequent falls." These days I rarely fall. After breaking my leg while trying to show off, ripping off a toenail days before an international trip, and clutching mostly naked men to stay upright, I’ve learned my lesson. It’s just not worth it. I use every available walking aid: canes, forearm crutches, walkers, trekking poles, grocery carts, you name it. And I’m not shy about my disability. Hell, these days I make restaurant reservations under the name Gimpy Dave. (“Did you say your first name is Gimpy? Or is that your last name?”) I always get a great seat and a big smile. Yeah, I may be gimpy. But nothing trips me up. The moment I start cranking, feelings of liberation, glee, freedom overpowered my multiple sclerosis. MS, what MS? And then in the next moment, feelings of terror and dread took over. 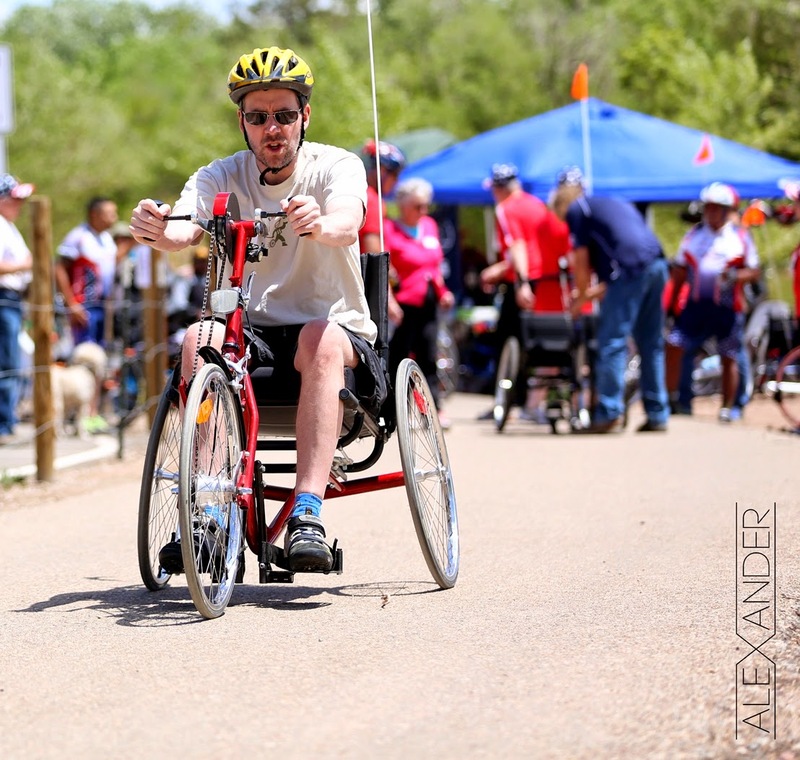 For the first time I was “pedaling” a hand-powered adult trike. The breeze of speed weaved its way through the vents of my bike helmet, its strap still crusty with five-year-old sweat from my last ride on a two-wheeled bicycle. All was right with the world. Until, that is, I reached cruising speed, when I realized that I had overlooked one minor item. How to stop this particular hand-powered adult trike. “Um, where the hell are the brakes? !” I called back to Jackie, a physical therapist at the US Veteran’s Administration. The VA was hosting a day of adaptive cycling for disabled veterans and others with disabilities and I was giddy to get the opportunity. Before riding I had noticed that a few of the other cycles had hand brakes connected to the hand crank, but this trike was, by all appearances, brake free. A hand-guided, hand-powered missile traveling at, well, subsonic speeds of 7-9 mph. For the afternoon I got to test four trikes in total, two hand-powered and two foot-powered. Each had their plusses and minuses, and can best be described in terms of far faster, far larger, gasoline-powered motor vehicles. The Convertible Sports Car. 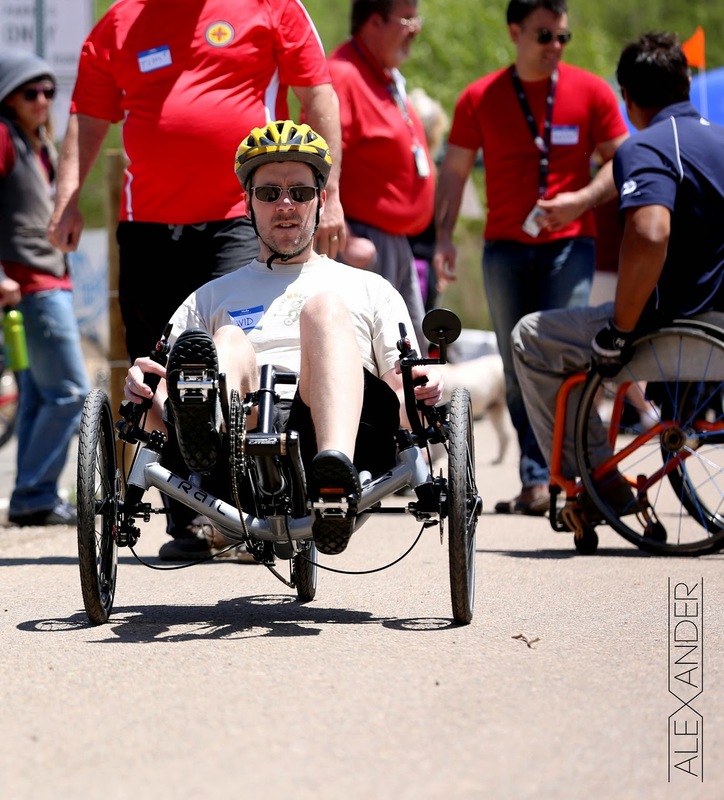 All of the foot-powered trikes out for demonstration were set up with two wheels in front and one in the rear (a “tadpole” design). My first ride of the day was on a silver Catrike Villager, and it felt like driving an open-air sports car. With my wonky legs, it wasn’t a drag racer (alas, no leg-powered bike of mine would ever burn rubber at the strip), but it was quick and snappy and hella fun. Turns were immediate and stable while the seating was comfortable—low, but not too low. Operating the trike, with the steering by your hips, felt natural. I breezed the mile down the trail on my fresh legs to the designated turnaround point and wanted to blow by the volunteers to keep exploring. But since the event was billed as a day to experiment with different trikes, not to abscond with them, I pulled a U and headed back. The School Bus. The first hand trike I tried, a generic version, was an upright model with a tall bench seat that was decidedly old school, which is probably why it felt like driving a school bus. Not that I’ve ever driven a school bus, but I’ve got a pretty good idea that one lumbers along like this trike. With two wheels in back and one wheel in front (a “delta” design), you crank and steer at the same time. Going in reverse slowed or stopped the cycle, triggering a large stop sign to swing out and red lights to start flashing. Or at least so it seemed—the trike felt heavy. Hills were challenging, requiring a good bit of effort to climb even in the easiest gears … and even more attention to descend. Being so upright was not very stable and braking while turning didn’t feel natural at all. The SUV. The Terra Trike Rambler wanted to be a sporty SUV (think BMW or Infiniti), versatile with a bit of panache. Alas, it felt a bit more pedestrian on this test ride. The higher seating position, a trademark of Terra Trikes, should have made entry and egress rather easy, but that would be wrong. The distance from the axle (which you have to stand in front of to mount the bike) to the seat is considerable, so you fall into the seat rather than lower into the seat. The higher seating position also meant sacrifices in handling. It just felt a bit clumsy and not quite up to the Catrike (fair enough, the Catrike is at least a third pricier). Because clip-less pedals were not available that day for the Rambler, folks had to use ace bandages (“the duct tape of physical therapists!”) to wrap my feet to the pedals. And being attached to the pedals is rather important. If a foot slides off, it could slide under the trike. If your foot slides under the trike, odds are rather high it’s going to hurt. A lot. 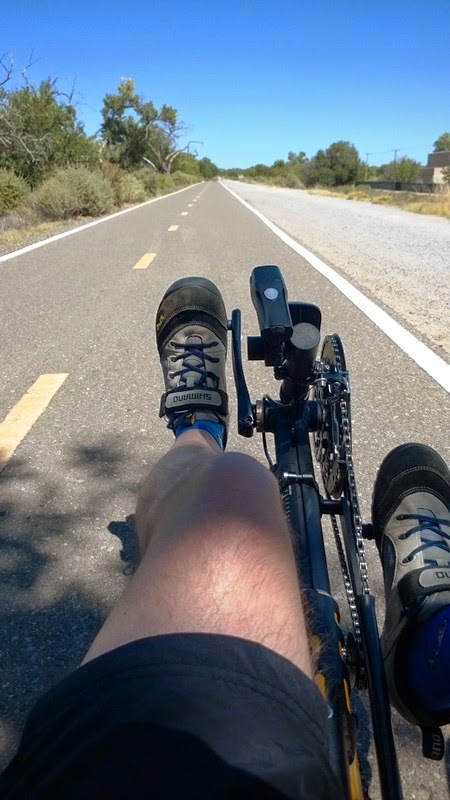 Consider clip-less pedals mandatory for all foot-powered trikes. The Muscle Car. I far preferred this lower slung hand trike, the Top End Force 2 from Invacare, to my school bus. Although it had a larger turning radius and it was more challenging to wriggle out of the seat, the speed of the trike was addicting. These brakes were on the crank, so they spun with your arms, making them more intuitive to use. But with this V8, I rarely braked, flooring it instead. The trike didn’t feel especially spry or nimble, but it was fast and liked the open throttle. To get up to speed, I spooled through the many gears—which, it should be noted, is a bit awkward, since shifting is done on the center shaft, meaning that you have to remove one hand from the crank (which is also where you steer). Once I reached cruising altitude (a muscle car that flies! ), Jackie informed me that it was time to stow my tray table and return my seat to its upright position. Doh! I didn’t want the afternoon to end. The entire experience was fabulous. Jackie and others at the VA (thanks Michelle!) ensured the event went smoothly, and the volunteers were more than up to the task. I’ve got to give a shout out in particular to Charlie, owner of Albuquerque’s Two Wheel Drive (http://twowheeldrive.com/). To my knowledge, his shop sells more trikes in New Mexico than any other cycling store, and Charlie knows his stuff. Note, most of the photos you see here are courtesy of Alexander Tran, another volunteer. (www.alexanderphotographyNM.com). What’s next? 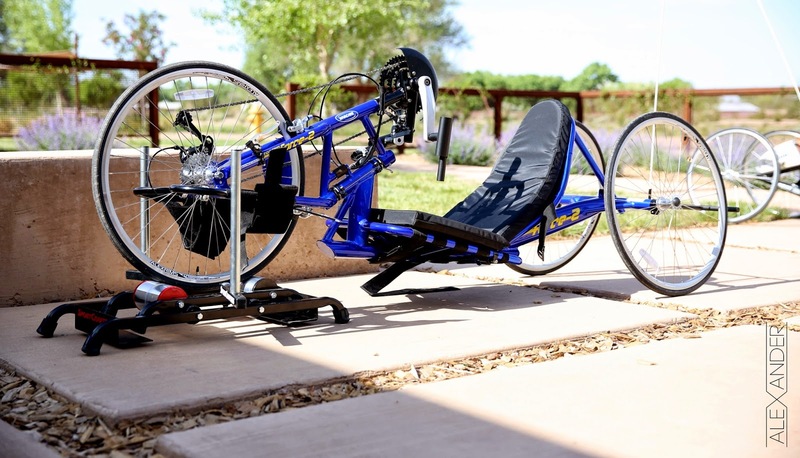 An exclusive test of an innovative adult trike: the new e2, a joint effort from Edge Recumbents (http://edgerecumbents.com/e2/) and Evolve Trikes (http://www.evolvetrikes.com/). I have been waiting for a few years for this tadpole three-wheeled bicycle to hit the market, closely following its Australian design and development. The first e2 tricycles are being shipping in June 2014 from Edge’s Tennessee facility. With the quickest fold and most compact design (and a planned future power assist option! 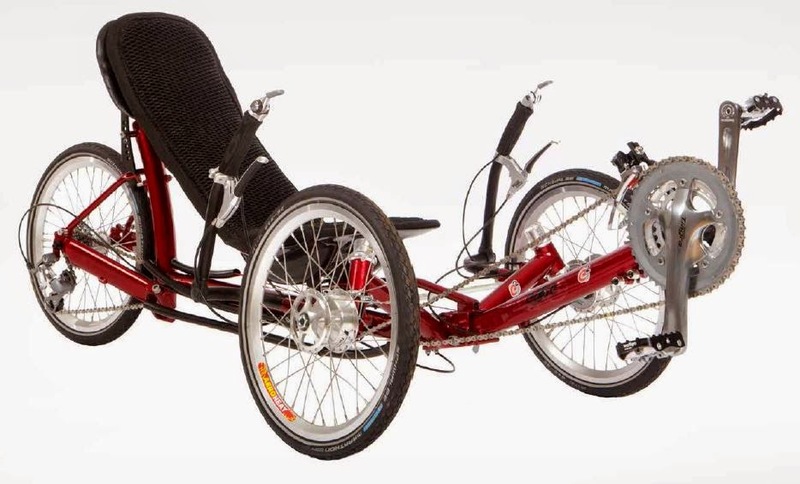 ), will this new foldable recumbent trike be the best for those with a disability like multiple sclerosis? With a prototype being shipped to my front door in the coming weeks, I’ll soon have a much better idea. It was clear the moment I opened the welcome bag that the marketing and communication representatives at EMD Serono and Pfizer had done their research and knew the secret key to endearing themselves to MS bloggers: feed us. Contents of said welcome bag: Utz Pretzel Stix (1 package), Chips Ahoy! cookies (4), Nutter Butter cookies (4), Peanut M&Ms Fun Size (4 packages), Club & Cheddar Sandwich Crackers (6), Cheddar Goldfish (1 package), Oreos (6), and for the appearance of health, one Simply Balanced fruit and nut bar and two packages of Natural Almonds (unsalted and unroasted!). The only two things absent from the welcome pack of my dreams? A six pack of craft beer and a bag of Cheetos. Such a missed opportunity. I guess I shouldn’t question why I was the only one with a plastic fork. As for the influencers with access to traditional flatware, they included my new (and dear) friends blogger Nicole Lemelle (www.mynewnormals.com), writer Lisa Emrich (www.brassandivory.org), and author Jon Chandonnet (www.jonchandonnet.com). The other six silverware users all have equally powerful social media resumes, many of whom you may recognize: author Debbi Petrina (www.debbiems.com), bodybuilder/author David Lyons (www.msfitnesschallenge.com), humorist/author Yvonne deSousa (www.yvonnedesousa.com), advocate Laura Kolaczkowski (http://insidemystory.com/), blogger Lisa Dasis (www.mslisasays.com), and some newsy viewsy dude named Stuart Schlossman (www.wwwmsviewsandrelatednews.blogspot.com). We all got to break bread together the night before the summit (note: a couple hours after getting our food-filled welcome bags) to exchange both friendly hugs and audible gasps when discovering one’s website was completely unfamiliar to another. The first big surprise: nearly half of the bloggers have a written a book. Now I’ve been writing professionally for more than two decades, yet I can count the number of books I’ve written on a closed fist. For years I’ve been making excuses to my wife Laura (I have this disease, blah, blah) and being surrounded by book authors with MS was only proving my wife righter and righter by the minute. The second big surprise: EMD Serono and Pfizer took our gathering—even yours truly—very seriously. There was a detailed preprinted program, they listened intently to our discussions, and by my count nearly two dozen staffers were participating in some facet in our summit. When they said we would meet senior leadership, I was expecting perhaps directors of their social media communications department and maybe a costumed mascot of the drug company. I was wrong. We were given unprecedented access to the top. The tippy top. For a full hour during lunch, we listened to—and questioned—EMD Serono’s president and managing director Paris Panayiotopoulos, the head of the MS platform in global research and early development Mark Shearman, PhD, and the head of US medical affairs and neurodegenerative diseases Fernando Dangond, MD, FAAN, MB (no clue what all those letters mean, but I’m assuming important stuff). I was well prepared with detailed and specific questions—thanks in part to the help of fellow members of ActiveMSers—inquiring about the status of their present MS research. You can read about the research here, released at the American Academy of Neurology annual meeting two weeks after our gathering. The panel also addressed their ongoing efforts in seeking treatments for progressive forms of MS and EMD’s dedication of resources to R&D for this particularly fickle disease path. I was ready to pepper in a few more Qs, but when I made eye contact with the vice president of US communications Lisa Buffington, who after the morning session was more than familiar with my brand of humor, it was clear that she felt that a) the Q&A session had gone extremely well to that point and b) maybe she should end the session before Dave misbehaves in front of the president of the company on her watch. Admittedly, she was probably right. 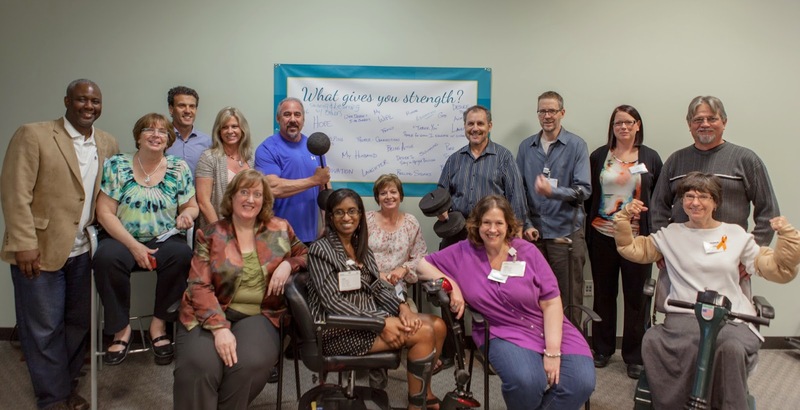 Case in point: during our tour earlier that day of EMD Serono’s patient helpline facility, MS LifeLines (www.MSLifeLines.com), we got to meet—and question—a number of staffers, from reimbursement/copay experts to certified MS nurse specialists. When one of the nurses, who had spent countless hours to become certified, was describing the lengthy process, some wiseacre piped, “So basically you had to complete a three question true-or-false quiz.” Nurse, you have been officially introduced to Dave humor. Sorry. After lunch, the blogging team was presented with a private sneak preview of EMD Serono’s upcoming marketing and communication initiatives. And now I’m being reminded at this time by Laura to keep my pants on, as she does not own a pair of welding glasses, much less a welding helmet. Alas, I can’t talk specifics about their forthcoming social media efforts. But I can say it should serve the MS community well. I’ve long gone to great lengths to avoid German. And I’ve always failed miserably. Alas learning a foreign language was a requirement in high school, so I stumbled and bumbled through three years’ worth, all the while wondering why I didn’t take Spanish. (This lament was only amplified when I moved to New Mexico.) In college I specifically chose a major, electrical engineering, that had zero foreign language requirements. Yippee! The downside? I quickly discovered I had as much aptitude for being an engineer as a goldfish with a slide rule. I also had zero motivation—I was supposed to be a writer. Curses. For me to get a college degree, I had to take a foreign language. Four entire semesters. Two entire years. Sixteen ungodly credit hours including lab time. I was doomed to fail. Until I met a tall blonde German angel—Trish Hornick. “You took three years of German in high school… and all you remember is how to count to ten?” Trish, her uncommon laugh echoing through our dorm, was quick to pick up on the obvious. Although she had no accent, she was born in Munich and her entire family spoke German. And she agreed—inexplicably and for reasons I will never know—to help me wade through Deutsch, to help me graduate. We would become lifelong friends. I didn’t realize how successful Trish had been until more than a dozen years later when I tried to communicate with an innkeeper in Dürnstein, a picturesque Austrian town on the Danube. Other than perhaps the ability to count to ten (sound familiar? ), the innkeeper spoke no English. None. So I pulled up a chair and we, well, chatted in broken German for over 15 minutes. I told her about my family, my work, even the weather in Albuquerque. What the hey? I was talking—conversing—in German. I was so excited that I couldn’t wait to call Trish to tell her of such an epiphany. Earlier this year I was going through greeting cards from the holidays, giving them one last glance. Over the years, that stack of Christmas wishes has gotten smaller and smaller. Using the postal service is so passé these days—Laura and I are fortunate just to get photographs with pre-printed greetings carefully sent by Costco. But there was one single card I could not part with. 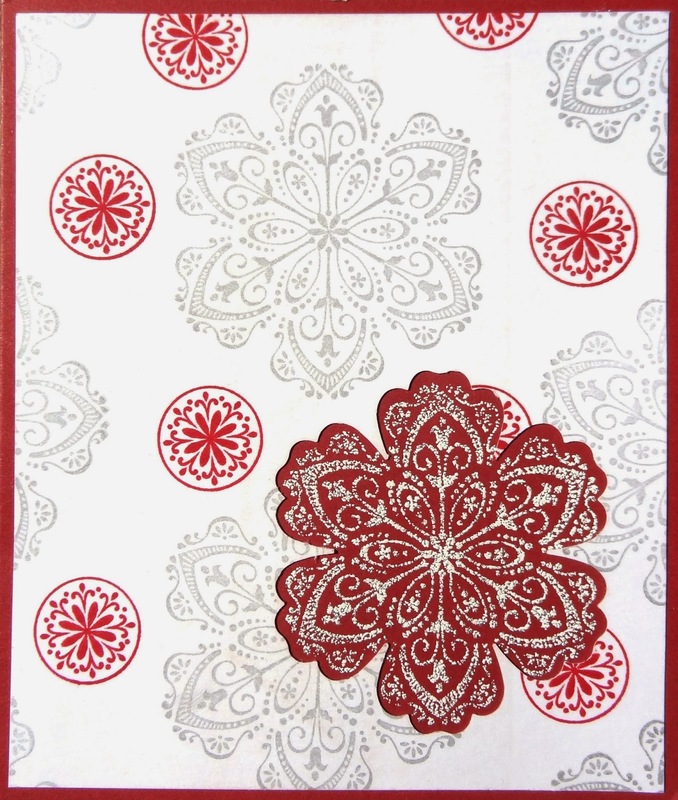 It was a richly decorated handmade greeting covered with snowflakes … from Trish. A piece of art born from an envelope. No two will ever be alike. The one-of-a-kind snowflake card. And my German angel. I e-mailed Trish to tell her just how fond I was of her artwork, not mincing words. “I'm like, what the hell company makes a card this nice? Ohhh. Duh.” A minute later the phone rang and we chatted for the next half hour. About things friends talk about… and probably having another laugh about my pathetic German. It was the last time we ever talked. For all the fantastic times and for the unforgettable help in German, Danke schön, Trish. Tschüss. Trish Hornick-Rexrode died March 6, 2014 in a car accident. 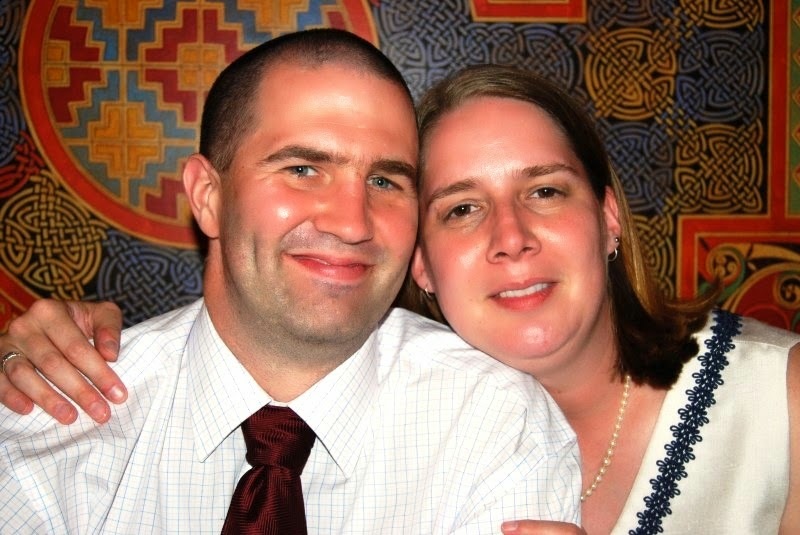 Her husband, Drew, who mirrors Trish in remarkable generosity, survived. 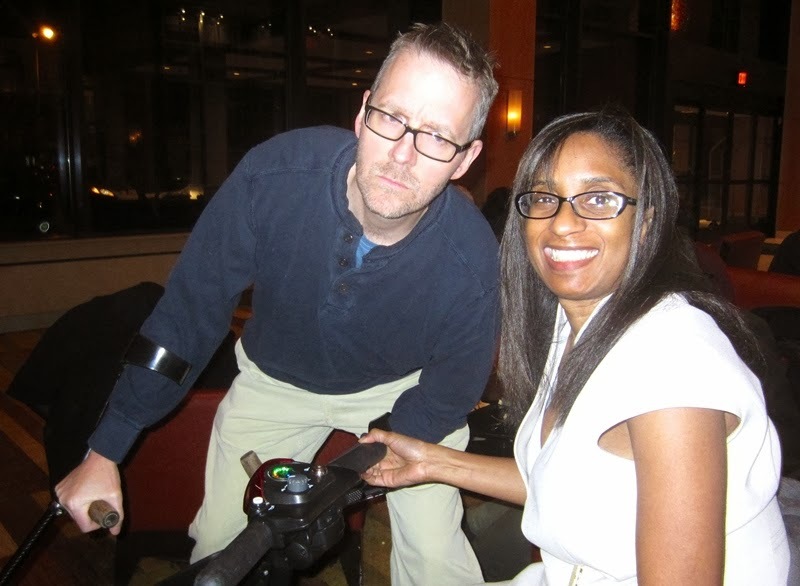 When I received an invite to attend an “MS Blogger Summit”—with travel, accommodations and food comped for me and my caretaker (aka wife)—my right eyebrow went skyward and my Spidey Sense started to tingle. Either that, or my MS was just acting up. In any case, I was suspicious. 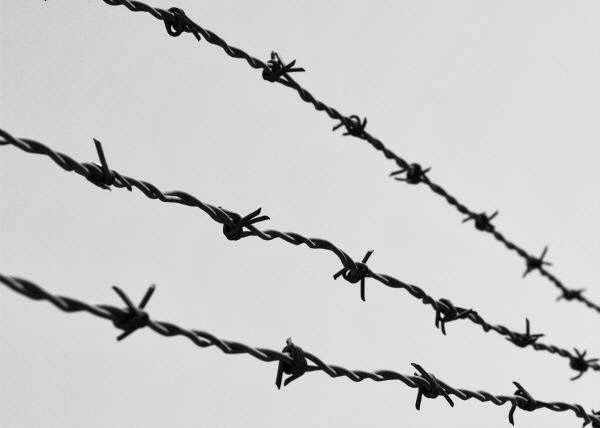 While I’m not anti-Big Pharma, I prefer to keep them at arm’s length, approaching them with the same caution I’d use when stepping over a barbed-wire fence or juggling chainsaws. In truth, all pharmaceutical companies are somewhat hamstrung in their outreach, for better or for worse, by strict FDA regulations. Many of these regulations make brilliant sense and we need them in the industry. But some, hmm. For instance, every Gilenya Tweet needs to be approved by the FDA. Every. Single. One. Even if it has nothing to do with the medication. The four-word Tweet “Have a great weekend” would need approval, which takes days. And there can be no mention of multiple sclerosis or any benefit of the drug without a complete list of all the side effects. So don’t be personally offended when they don’t respond for days (or ever) to your Tweet or Facebook post—they can’t. And when regulations change, which is often, web pages (like a YouTube channel) will randomly go down so drug companies can revise them to come back into compliance. It’s a tricky dance, like trying to cha-cha while skydiving. If there was one general take away with our posse of posters from the summit, it did serve to at least humanize Big Pharma. They listened, and listened intently, or at least so it seemed. Hopefully some of our advice—and we tossed out lots—will be implemented, and the MS community as a whole will benefit. But before we all join hands and sing Kumbaya, a few too many on the Novartis side of the table used the phrase “fair and balanced,” as in that’s what they were striving to accomplish with their outreach. That’s like saying “I’m trustworthy, so trust me.” Guys who say that, well, I don’t trust. It lacks authenticity. If you are truly “fair and balanced” you should never have to say so—it should be readily apparent in your actions. Novartis clearly has work to do, as do all pharmaceutical companies, but after our summit, it appears they may be on the right track. 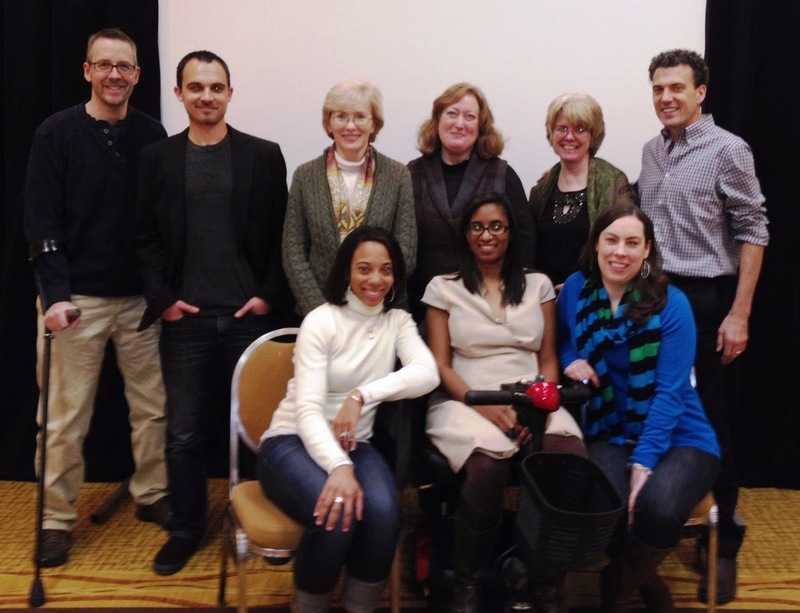 For takes from a few of the other bloggers at our meeting, all of whom I now consider friends, click on the below direct links. When the marketing folks at Novartis (makers of Gilenya) conjured up an MS Blogger Summit, inviting a group of nine diverse posters for an all-expenses paid trip to the sleepy climes of Morristown, NJ, they probably had a preconceived idea of how the event would unfold--engaging in discussions about the communication needs of the MS online community while getting candid feedback on some of their social media efforts. And it would all start with a casual, friendly welcome dinner the night before, just steps away from the hotel. However, they didn’t count on a few things: single digit temperatures, piles of snow, icy sidewalks and a certain smartass blogger. Dave expresses concern, while Nicole smiles in the face of danger. I often voice my opinion with tongue firmly in cheek, but there is usually just enough truth for one to take pause. And after meeting me only minutes earlier, and not fully adjusted to my candor, the representatives from Novartis likely were mortified. A gaggle of MSers, including one using a scooter and another forearm crutches (yours truly), were trying to walk to a restaurant a scant 269 feet away from the hotel. The problem? Our path was blocked by berms of fresh snow, requiring us to walk down the street to the crosswalk ... that was still chockfull of snow. (For the record, the temperature that night plummeted to a low of one degree, and let’s not even discuss the wind chill.) I was merely pointing out the obvious, and it wasn’t going to get any safer. Wine and beer was going to be served with dinner. To people with MS. Who may have balance issues. A perfect storm was brewing. Around the dinner table were individuals with a delightful mix of talent: blogger superstars Nicole Lemelle (www.mynewnormals.com) and Lisa Emrich (www.brassandivory.org and www.msbloggers.com), author Jon Chandonnet (http://jonchandonnet.com/blog/), clinical trial advocate Jeri Burtchell (www.partnersinresearch.org), longtime poster Joan Wheeler (www.shortinthecord.blogspot.com), community advocate Jodi (www.jodibeansblog.com), and wise-cracking, heal-wearing Jamia Crockett (www.mymsheels.com). My wife Laura and Nicole’s engaging husband Tommy joined in as well. Only 23-year old Matt Allen (www.mattsms.com), who was arriving later that night, was absent. To say we all bonded was an understatement. After all, each of us realized this may be our final meal given the conditions outside. At least I would have an opportunity to toast one last year of marriage to my wife Laura; it was our 21st anniversary that night. And with the New York/New Jersey area trailing only the West Coast in wineries, it was bound to to be a special toast. “We have red--and we have white.” Our waiter was holding up two magnums... of Yellow Tail. Many New Jersey restaurants have a BYOB policy and Novartis, in a clear effort to wow bloggers with frugality, procured the Australian wine best known for being served free at office get-togethers. It’s not to say I won’t drink YT, and indeed I even have a special bottle in my closet. From 2006. I haven’t found anyone to take it off my hands in eight years. I suddenly felt more in a beer mood, and I wasn’t shy about saying so. About this time the poor folks at Novartis were no doubt rethinking the wisdom of inviting me. They shouldn’t have. I give everyone I like personally a hard time, even folks I’ve barely met. To their credit, it was because of their efforts and careful vetting of bloggers that the evening unfolded enchantingly (complete, yes, with Hopfish IPA from New Jersey’s own Flying Fish Brewery). Indeed, we were all having such a wonderful time, none of us wanted the evening to end, and not just because of the impending harrowing walk home. We needn’t have worried. Safety being a (newfound) priority, a warm ride was waiting for us in front of the restaurant. Due to liability reasons, Novartis had to use a car service--no personal chauffeuring allowed--and there were few options available at a moment’s notice. So a stretch limousine drove us the .05 miles to the hotel front entrance. Fourteen seconds. Novartis wanted to make sure that their first-ever MS blogger summit the following day was going to go off without a hitch ... and with all attendees fully, and safely, accounted for. Spoiler alert: they succeeded. For most people, New Year’s resolutions go the way of fleeting fame, re: the Man with the Golden Voice. (Forgot him already? Rewatch his viral video from 2011 here: http://www.youtube.com/watch?v=6rPFvLUWkzs). Resolutions start out with the best of intentions and then after a few weeks (which as the formerly homeless radio announcer discovered may or may not include a visit to Dr. Phil and a trip to rehab) they crumble into fine dust and skitter away in chilly late January winds. There has to be a better way. It turns out there may be: announce your intentions, say researchers. In particular, tell strangers, like those on an internet forum, about your designs for a better you. 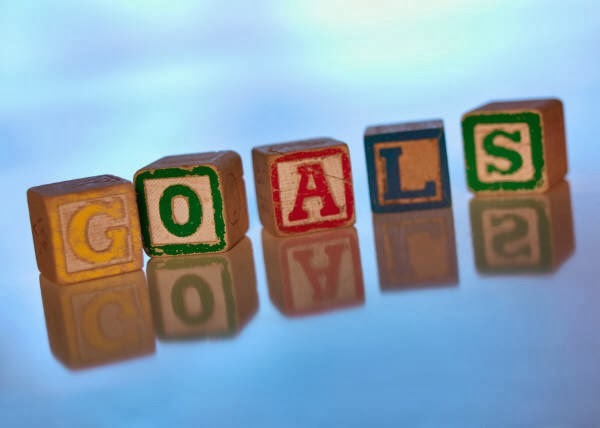 Studies have found that the more folks who know about your resolutions, the more folks you’ll have in your corner to root you on to accomplish your goals… and the more pressure you’ll put on yourself to make good on your commitments. And why strangers? Unlike a skinny family member who might relish being “the thin one,” compatriots like those on the messageboard of ActiveMSers (http://forums.activemsers.org/index.php) don’t have hidden agendas. 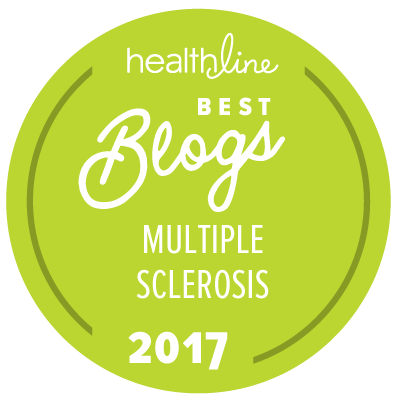 Better yet, you share that common bond of having multiple sclerosis and understanding the daily challenges involved in fighting a chronic disease. So you might not know me, and your resolutions might have already moved back to a shelter in Ohio by the time you read this, but know this: I believe in you. After all, you’re here, right? Sometimes that first step in turning a new leaf is more of a shove from behind. So get your a$$ in gear! You can do this. Absolutely you can. Just let me and your virtual friends help you out. Oh, and how do I guarantee my resolutions stay intact every year? Easy. I always make a resolution not to make any more resolutions other than the one resolution not to make any more resolutions. Works like a charm every January 1st. Originally published January 25, 2011. Edited and expanded for clarity.